New to business or asset finance? Here are some benefits of using an asset finance lender. New credit line: Asset finance lets you access a new line of credit alongside your existing bank facilities. Quick access to funding: As a business owner, contractor, dealer or owner operator providing services / completing projects, time and resources may not always be on your side. Access funding as and when you need it through asset finance. Finance secured against existing assets: In most cases only your existing business assets (equipment / vehicles etc) are secured against your finance plan. Fixed interest rates: All of our asset finance plans come with fixed interest rates and monthly repayments so you can easily budget business expenses. Long lease: Our repayment terms are available from 12 – 84 months and agreed to suit your business requirements. How does the process work? 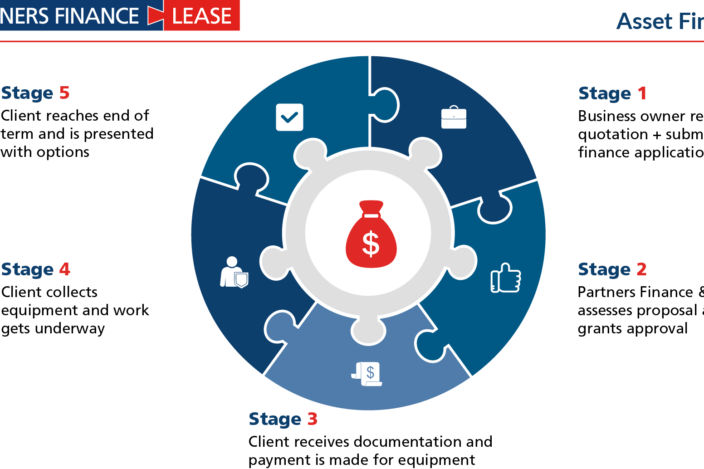 The following diagram explains the 5 stages to asset finance with Partners Finance & Lease.